Based on research conducted by the Tufts University School of Veterinary Medicine, scientists concluded that the physical brain structure in felines is strikingly similar to that of humans. With an average size of just two inches in length, it lacks the complexity of the human brain but that does not prevent it from possessing some significant skills and abilities under the right environmental conditions. Just like in humans, learning occurs through observation and repetition and when owners take the time to work with their feline companions, visible demonstrations of intelligence can soon follow. Studies have shown that cats posses the sensory-motor awareness of a two-year old human child and can develop and recall objects not visible through direct sight. 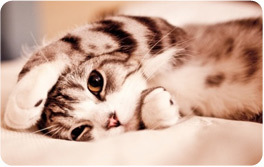 Some experiments under controlled conditions indicate that a cat can recall information for as long as ten years! There are plenty of humans who would be thrilled to have a memory like that. What can cats actually learn? You might be surprised by the answer! Cats can learn to recognize their own names, differentiate between numbers, and even perform sign language to communicate their wants and needs. The key to training your cat to advance his or her cognitive ability is patience and an understanding of how a feline's brain works. First of all, it is important to understand that cats are born hunters. Their natural instinct is to conserve energy for a period of time and release it in a sudden burst when it's time to catch a meal. This is part of the reason why your cat may go from enjoying a playful game one minute to complete disinterest the next. A cat will naturally evaluate the risk-reward ratio of almost any task and make an instant decision on whether or not it is worth participating. Cats are willing to learn but they must easily see the reward for their efforts or they will quickly disengage from the activity and move on to something else. To teach your cat a “trick”, you must start slowly with small achievable steps that ultimately progress towards the desired task. Be careful what you wish for though because once a cat develops the skills necessary to watch a behavior and solve a problem, it isn't always easy to get your furry friend to stop. Here's something you can try at home. Find a treat that your cat enjoys and keep it with you but hidden from sight. Next, take two white sheets of paper and draw a large circle on one and a square on the other. Set the two sheets of paper down next to each other with about six inches of space between them. Bring your cat over and touch his or her paw to the circle. Immediately after doing so, give the cat a treat. Do this several times over the course of a few weeks. After much repetition, you cat should learn that the circle means “treat” and eventually will take the initiative to touch it to get the treat. You can gradually work your way up to tougher challenges by changing out the second shape or switching the position of the two sheets. You can use a similar method to teach your cat to recognize his or her name written on a sheet of paper. Just be careful how far you develop these skills in search of YouTube fame and fortune because it is not unusual for a cat to learn how to jump up and open a door, turn on the water in a sink, or use a paw to slide open a treat drawer. Remember that positive reinforcement goes a long way and that patience on your part is an absolute must. Some cats are more motivated than others and depending on the age of your cat, he or she may be a motivated learner or not very interested at all. 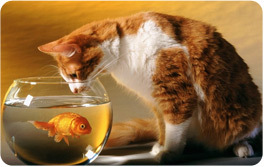 Just like humans, kitties have unique personalities and learning styles so don't get too frustrated if your little friend would prefer to look out the window or gaze into the aquarium in the living room. With a little practice and a steady dose of positive reinforcement, you should be able to see some impressive progress!